My first trip of the year was to our tiny neighbor of Saba, a lush paradise with amazing hikes and some of the best diving in the world. I did not go for any of that though. All I wanted was a few days to explore the island, meet new people and de-stress. Saba is known to be very quiet and quiet sounded like heaven at that time. Of course it didn’t turn out as quiet as I had hoped but I did get to see so much more than I have seen before on previous trips and got to stay at a nice little spot called Scout’s Place. Highlight: Making new friends and getting a tour of the island by a local photographer. My husband finally understands my needs and for my birthday he gave me what any traveling island girl wants, a ticket. Not just any ticket. A ticket to New York City. Last time I was in this magical city that never sleeps was 7 years ago when I said “I’Do” to my husband. I guess most people flock to the beach for a romantic wedding, while my husband and I prefer skyscrapers and hordes of people as the perfect background for our wedding photos. Anyway, back to the trip. We stayed 10 days this time around and I got to explore quite a lot of Manhattan itself. Of course this is New York City we’re talking about and it is impossible to see all that it has to offer in just one trip. So, I guess another NYC trip will soon be in order. Highlight: I got to finally visit the D.U.M.B.O., chased murals in Bushwick and had the best dining experience of the year at a Harlem restaurant called Red Rooster. You know you’ve done a good job the first time around when the tourism office of Nevis calls you up to invite you for a second visit. This time I was not alone but was joined by two of my island blogger pals, Brittany from the Windtraveler and Jennifer from Jen there done that. Together we explored the entire island, saw monkeys and donkeys, swam in one of the Four Season’s beautiful pools, had great food, learned how to make sugar cakes and drank a bit too much on a sunset cruise. We truly enjoyed the hospitality and friendliness of the people, from the staff at the Mount Nevis Hotel where we stayed to the average person we struck up conversations with in restaurants or during one of our tours. Only 20 minutes away by ferry you would think I would be visiting Anguilla every weekend, right? Would you believe me of I told you I only set foot on Anguilla twice this year? Although that number is way too low if you ask me, I am still immensely grateful for having had the opportunity to visit at all. Once at the invitation of Anguilla’s Literary Festival, where I had to do some public speaking and subsequently crashed and burned…hard (I will spare you the embarrassing details) followed shortly thereafter by a day trip with my first ever Boss Women Retreat hosted by “moi”. September was a stressful month. It’s usually the peak of the hurricane season and thus quite busy when it comes to storms. We prepped like it was doomsday and tried to keep our nerves in check. But I also got to cash in on a ticket to Europe we had to postpone due to the 2017 super storm. I decided that it was high time to visit my little brother in Antwerp again. I can hardly explain in words how wonderful it was to be back in a city I love so much. I’ve always said (and continue to say today) that should I ever find myself moving back to Europe that Antwerp would be my new home. I got to explore the city solo while little brother worked and dined with him after work at great little restaurants. It was an amazing and memorable trip. Highlight: It’s hard to just pick one. The whole trip was a highlight and spending time with my brother turned out to be something I needed terribly and didn’t even realize I did. Click here for all the highlights of that trip. What better way to end my European adventure than three days in the city of love?Needless to say, three days in Paris is not even close to enough to see all the city has to offer. It is definitely not enough to sample all the restaurants we wanted to eat at but we did have fun discovering, exploring and getting lost in the city. Highlight: my husband surprised me by joining me for this part of my European trip and even though we fought and bickered the entire time about where to eat and what to see, we did manage to have a lot fun exploring the city of love together. A trip home is always a great idea. I get to see my parents, old school friends and revisit places from my youth but when your little sister and little brother plan a small family reunion on your birth island, it becomes something so much more special. Curaçao is home. It’s where I grew up. The island helped shape me into who I am today. So, a visit to this Dutch Caribbean island is aways special and when I get to explore it with my explorer buddy and little brother it is so much more amazing. While the rest of the family enjoyed pool time and baked in the sun, we embarked on an adventure to the rural part of the island (which is not so rural anymore), where we visited a museum of the traditional “K’ai Orgel” or cylindrical piano, a trip to Ascension park, we swam with turtles at Playa Piskadó and ate at a restaurant serving authentic local food. All of it was a first for me. I’m almost ashamed to admit that. Highlight: Exploring some parts of the island with my brother and seeing the many colorful murals in Punda. I just love impromptu little trips. I especially love it when those unplanned little trips are to places I have been to so many times before but just cannot get enough of. Miami is one of those places. The Wynwood and Midtown areas specifically. So, I was totally excited to return to Miami in October of this year for a short trip. I was especially excited to see my island sister Chrissann from Women Who Live On Rocks again, after what seemed like an eternity and I got to meet her adorable pup Diego, who is quickly becoming the most well known pup in Miami. My actual sister lives there as well so I finally got to see her and hug her again after a year. That’s what I love about Miami. It feels like a second home. There are always friends and family to catch up with, and staying in an Airbnb apartment makes the whole experience more pleasant and we always have a hard time leaving. highlight: A blogger’s meetup where I met with bloggers and Instagram friends turned Real-Life friends Jetset Sarah, Shakespeare Travels, Journey with Candi and others. My second Boss Women Retreat was to San Juan, Puerto Rico. Although the group slightly smaller this time we still managed to have tons of fun. From the traditional Puerto Rican home we rented in the heart of Old San Juan, to the delectable restaurants we ate at and the VIP shopping experience at the Mall of San Juan, I think it is safe to say that it was another memorable retreat. What I did after this retreat became my favorite travel moment of the year. I’ve always wanted to see more of Puerto Rico and I was especially interested in chasing some of its beautiful waterfalls. I finally got to do that in Aibonito and made a lifetime friend there as well. You know when you meet someone and it instantly clicks? That is what I found in my Airbnb host, Milly in Aibonito, there in the mountains of Puerto Rico. It is a place that quickly became so important to me and I cannot wait to return in November of 2019 with a group of like-minded women, lucky enough to experience this true treasure of Puerto Rico with me. 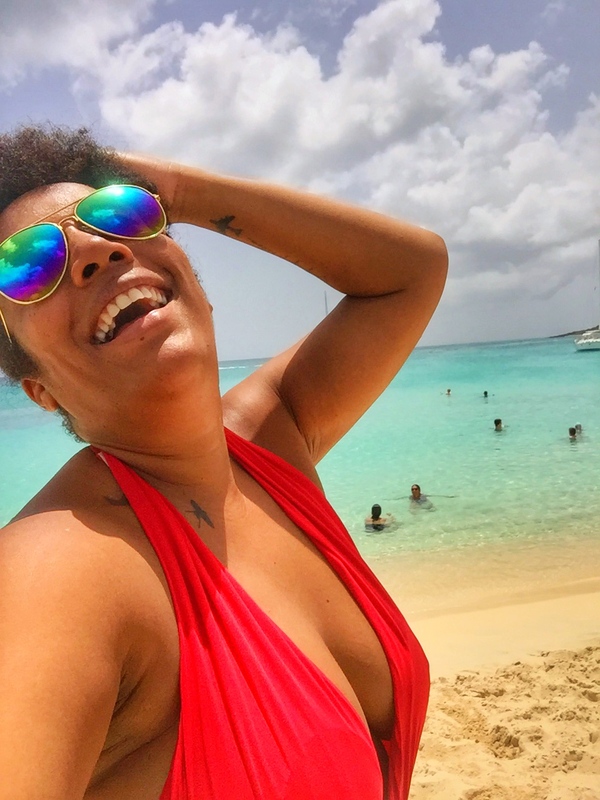 Yes, my Boss Women Retreat is happening in Nevis and Aibonito in 2019. Make sire you sign up for one or for both. Boss Women Retreats to Nevis and Aibonito are already pretty much set in stone. Check out the travel group page to learn more. As for solo trips and other travel plans, I have decided to just roll with it in 2019 and let chance and fate direct me to where I need to be. So, this year I am making no plans but will still hope that the universe finds a way to put Aruba, the Bahamas and Oregon and Seattle in my path. I’m going to just wing it ad see where else I will end up. As you can read, my highlights consisted more of the people I met that became important to me than the actual destinations themselves. That’s what I love about travel. It is the people you meet that make it so much more memorable. Don’t get me wrong the destination itself still plays an integral role but the people is what makes it truly special, whether they are old friends and family members or new friends you make along the way. What about you? What were your 2018 travel highlights and what are your travel plans for 2019?